The best easy readers for kids just learning how to read on their own are ones that have fun characters, simple sight words, and a little challenge. From classic easy readers to new series devoted to beginning readers, kids are sure to find a book or two they enjoy reading. When choosing books for children in kindergarten and first grade who are beginning readers, it is important to determine the reading level of books you are considering purchasing, even if they do follow the criteria listed above. If your child is with you, have him or her read the first couple of pages aloud. If the book is at an appropriate level for your beginning reader or struggling reader, she or he will be able to read the first couple of pages with just a few errors. Many books in libraries and bookstores are organized into categories like "beginning readers" or "early readers," making it easy for you to find exactly the right level for your child(ren). Additionally, it may be helpful to pick up an easy children's dictionary to help kids with unfamiliar words. When you're looking for the best books for first grade boys and girls who are starting to read, it is helpful to find some that are free. Read the LoveToKnow article Free Easy Readers for Elementary and find some great titles free. Try looking through the easy reader series offerings from companies that publish children's books. They often feature popular characters from other book series, television shows and cover topics that youngsters are interested in. I Can Read! books, available through HarperCollins, come in five different levels. This helps parents and teachers choose the best books for their beginning readers. Favorite characters are available in the books through the I Can Read! Series, including books featuring Amelia Bedelia and Biscuit, among many others. 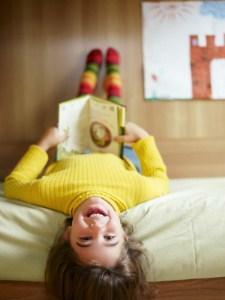 The Step into Reading books, from Random House, has plenty of great books for early readers. The easiest books for new readers are in the Step 2 category, for kids who read with help. Titles range from favorite children's characters from Disney movies, television programs like Thomas and Friends and Sesame Street and Barbie. Classic book characters like Berenstain Bears and Little Critter, along with other exciting books, are also available through Step into Reading.